Zuken has presented CADSTAR 16.0, is a complete design environment for PCB design – from initial concept through to product realization. This release contains across-the-board performance enhancements and design efficiency features. These include improved group handling and routing functionality, and enhancements to meet the demands of today’s high-speed designs. 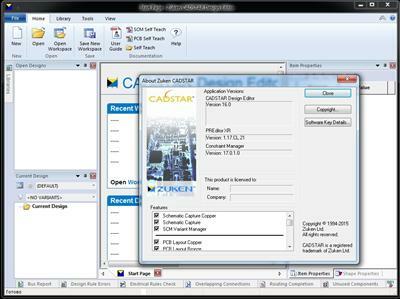 About Zuken CADSTAR 16.0: This version of CADSTAR PCB design software contains across-the-board performance enhancements and design efficiency features. These include improved group handling and routing functionality, and enhancements to meet the demands of today’s high-speed designs. CADSTAR’s Design Editor now allows items to be modified within a group, provides increased flexibility in shape creation, and introduces a new hand tool that allows panning of the display simply by dragging the mouse. The P.R.Editor move tool in Activ-45 has been enhanced to use the pusher and spring-back engine when moving vias, and the lengthen functionality has been enhanced to allow work on individual pin pairs. – Flexibility in shape creation – The flexibility and usability of the Design Editor shape creation functionality has been improved. – Modify items within a group – Items contained within a group in the Design Editor can be selected and modified without the need to first perform an ungroup. – Drag to add a connection – When working with a schematic in the Design Editor, performing a drag operation from a symbol pin will start adding a connection – in the same way you would drag-move an item. – Actual versus rule values included in the Design Rule Error List – The Design Rule Check Report within the Design Editor reports the actual spacing as compared to the design rule spacing for a given error. – Named property for PCB Only Pads – A property named “PCB Only Pad” is available for component footprint pads. – Pan easily using the Hand Tool – A Hand Tool is allows the display to be panned by dragging with the mouse. Simply press the middle mouse button and drag the mouse in the required direction, similar to Acrobat Reader and many other graphical tools. – Find using “Jump to Item” or “Net List filter” – The Design Editor Find command has a “Jump To Selected Item” option with First, Previous, Next, and Last choices, greatly simplifying the process of navigating through schematic items that span multiple sheets. – PDF output attribute filter – The Print to PDF setup has been enhanced to include an Attribute filter which allows users to control attributes that appear in the tooltips of the pdf file generated from Design Editor. – Floating Modeless Layer Setting dialog in P.R.Editor – The Layer Setting dialog in P.R. Editor is a floating and modeless window. – Activ-45 Move and Re-lengthening enhancements – The P.R.Editor Move tool in Activ-45 has been enhanced to use the pusher and spring-back engine when moving vias. – Unlengthen – An unlengthen command has been added to the P.R.Editor Routing menu. This allows users to remove all lengthening patterns from the selected net segments. – Analysis frequency ranges extended – Power Integrity analysis frequency range has been extended to 100kHz – 10GHz (previously 10MHz – 1GHz). About Zuken : Zuken works globally with leading companies to optimize their electrical and electronic engineering design and related manufacturing processes through the provision of leading edge software and consulting services. Our unique combination of proven experience, technological expertise and agility creates best in class solutions. Our transparent working practices and belief in integrity in all aspects of business produces long lasting and successful customer partnerships.